Private road close to the station. Spacious house standing on a large plot of rear & front gardens + 4 car driveway. Options to extend. Re-modelled to provide a large master bedroom with en-suite shower room as well as 2 further good sized bedrooms & a family bathroom, entrance lobby, cloakroom, dining room, sitting room, re-fitted kitchen, study & utility room. 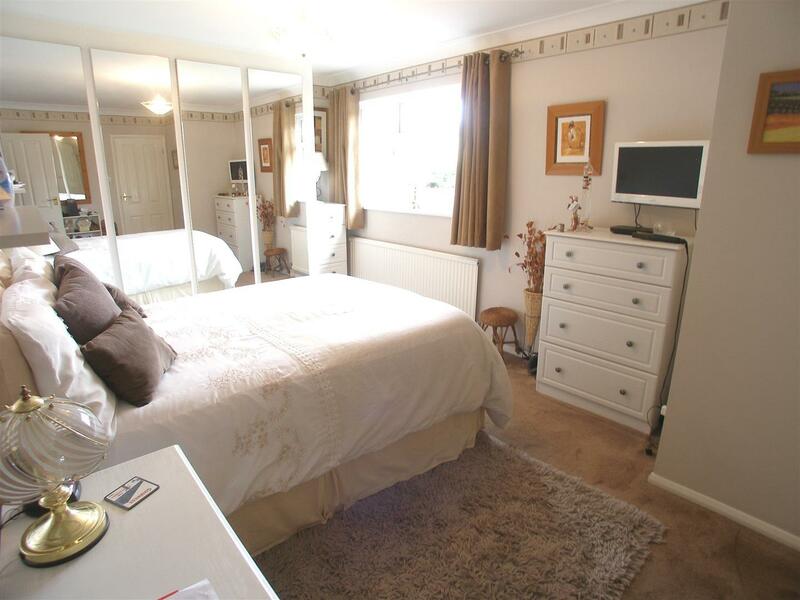 It is all very well presented & has gas c/heating & d/glazing. EPC Band D.
Laminated flooring. Stairs to the first floor. Doors to cloakroom & study/third reception room. Wall mounted wash basin. WC with concealed cistern. Radiator. Double glazed window. Laminated flooring. Radiator. Full-height double glazed window to the front aspect. Radiator. Doors to sitting room and kitchen. Large double glazed sliding patio doors to the rear aspect. Feature vertical radiator. TV point. Refitted in 2015 with an extensive range of modern gloss cream 'soft close' units which incorporates: dishwasher, fridge and stainless steel chimney style extractor hood. Stainless steel single drainer, one and a half bowl sink unit with swan neck mixer tap and cupboards below. Adjacent work surfaces with cupboards and drawers below. One double and three single eye level wall cupboards with lighting below. Laminated flooring. Six inset ceiling lights. Double glazed window and door to the rear aspect. Radiator. Ceramic tiled splashbacks to work surfaces and stainless steel splashback to the rear of the range style cooker which is available by separate negotiation. Cupboard housing wall mounted gas fired central heating boiler. Fitted work surface with spaces for washing machine and tumble dryer below. Laminated flooring. Double eye level wall cupboard. Two inset ceiling lights. Space for upright fridge/freezer. Built-in cupboard. Fitted with a modern white suite. Vanity unit wash basin with mixer tap and cupboard below. WC with concealed cistern. Large double-width shower cubicle. Five inset ceiling lights. Chrome heated towel rail. Ceramic tiled floor. Fully tiled walls. Double glazed window to the rear aspect. Double glazed window to the front aspect. Radiator. Double fitted wardrobe cupboard. Double glazed window to the front aspect. Radiator. Built-in airing cupboard housing pre-lagged hot water cylinder. Fitted with a white suite and fully tiled walls. Vanity unit wash basin with mixer tap and cupboard below. WC with concealed cistern. Radiator. Panel bath with glazed shower screen, tiled splash surround, mixer tap and Triton shower unit. A good sized rear garden which is approximately 60' in length. Full-width paved patio area. Large lawn area with shaped flower and shrub borders. Three fruit trees. Outside light and tap. Fence to one side and the rear. Mainly block-paved. Wooden garden shed. rockery and flower bed. Numerous shrubs. Gated side pedestrian access leads to the front garden. N.B. This area of garden offers scope to extend the house. A much larger than average front garden which is approximately 90' in width and 45' from the front elevation of the house. Block-paved driveway and hardstanding provides off-road parking for at least four cars. Large lawn area has shaped flower and shrub beds and borders. Various trees. Hedge to the front boundary. Wooden garden shed.